A piece of jewelry that combines symbols of faith with the sophistication of gold is the perfect choice for any special occasion or everyday wear. 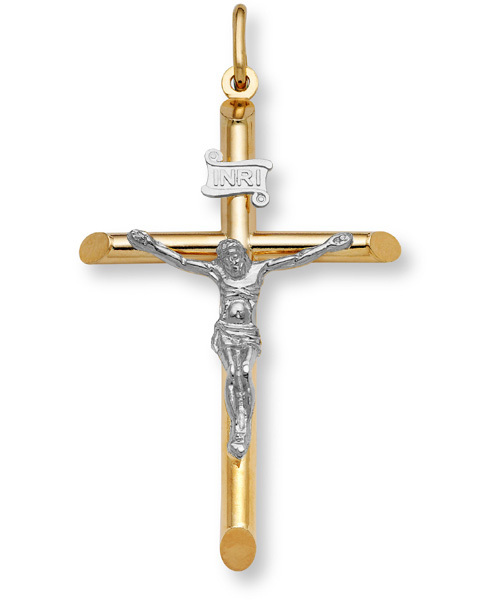 This crucifix pendant from Apples of Gold offers that and more. The two-tone pendant shows a radiant Christ figure, clad in brilliant 14K white gold. The cross is forged of rich 14K yellow gold and shows off a gorgeous cylindrical design. Apples of Gold makes this pendant whole with the letters "INRI" carefully carved hang above the figure in white gold. Cross measures 1 3/4" tall x 1 1/8" across (2 1/4" tall with hoop).